Hostel Old Quarter offers basic rooms with TV, shared or private bathroom facilities. Guests can start the day with English Breakfast, or nice drinks in our bars. 1. Guests are required to show a photo identification and credit card upon check-in. the Credit card details are only required to guarantee your stay. 50 euro deposit is required if you do not have a credit card. 2. Type of rooms : Twin Shared, Double/Twin Private. Double/Twin Canal view (the shared room has only Twin beds and not double bed). 3. Please note that all Special Requests (of double or twin beds) are subject to availability upon to arrival. 4. Please note that although the hotel has a lift, each floor contains stairs to get to the rooms. 5. Vallet parking service is available. An additional charges apply and need to be paid directly to the parking company. 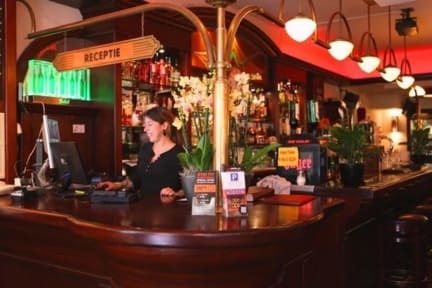 Guests need to contact the hotel 1-2 hours prior to their arrival in Amsterdam. The hostel was very clean and the staff were great. The location is great but it can be a bit loud if your room faces the street. Overall I really enjoyed my stay there and would consider using this hostel again. Rooms were very cold & noisy from the shops and bars below early in the morning. Great location. Clean and comfortable rooms. Would stay here again. The places is cool and it is placed in great location. The only thing that bugged me was the way how they approched a pre-authorization with me. They kind of lied to me saying how the pre-authorization works and that the money would released straight way for me to use and the money wasn't released because is not how a pre-authorization works. In any moment while I was booking I read that thr hostel would try to make a pre-authorization to check my founds without notice me. The staff are genuinely friendly, good people. This was definately a plus. The bar loungebarea is basic and quiet which is not a bad thing, it has what you need to get started for the day and the fresh orange juice and coffee are great. The location is right in between the station, dam square and the red light district. There is also a bicycle rent shop right around the corner. Shared bathroom/shower between many rooms and the cleanlyness of the halls is checked only once a day. This property was adequate for what a traveller needs... however the noise was really really unacceptable. I have stayed in hostels plenty of times before and know that with them comes a certain amount of noise etc. however when there's people yelling at the top of their lungs and banging on a door to a room in the middle of the night that's not ok. The door to the main cafe area was constantly slamming shut. We checked out a day early and found a room closer to the airport for a 7am flight. beware of the matresses! Thanks God I had to sleep there only for 2 nights otherwise I would have had serious back issues. Too soft! The pic showed a twin room with 2 beds next to each other, instead the beds were in such a tiny small room that it was not possible to put them beside (so my partner and I could have slept at least close to each other) The toilet didn't have any "proper door" and it was impossible to have any sort of privacy while on the seat. Too expensive for what you get! Pretty spartan accommodations. Comparable hostels are usually much lower. The entry is also just a standard bar not a normal hostel bar. So you walk through an open to the general public bar to go to your room. Doesn't rank high among the hostels I've stayed at. Mattresses were filthy, carpets were dirty, everything was ridiculously old and dingy, shared bathrooms reeked of urine, would not stay again. Although the location is great, this place is poorly managed. Checking in took about 15 minutes because the staff was unaware of what I had already paid, and they almost overcharged me by EUR 60. The room (private suite) was about EUR 143/ night with tax, and was extremely small; it’s a large closet. When I first walked in the bed was covered with dirt and hair. Unacceptable. Although this place seems to consider itself a hostel there really wasn’t any social atmosphere.